Do you want to create a completely unique look and feel to your contemporary space? With SimpliFireÂs four wall-mount electric fireplace options, youÂll take any room to the next level, with distinct ambiance and style. Choose from a variety of viewing areas and backlighting. Viewing options: 38Â", 58Â", 70Â" or 94Â"
Create a distinct contemporary look. 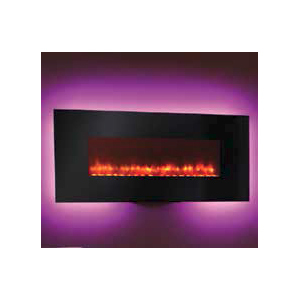 Four Wall-Mount electric fireplace models provide an instant upgrade to any space, with or without the heat. Simply hang these units on the wall and plug them in. Easily find the right size for your space-38, 58, 70 and 94-inch models are available, all with standard multi-colored LED backlighting to accent any decor. 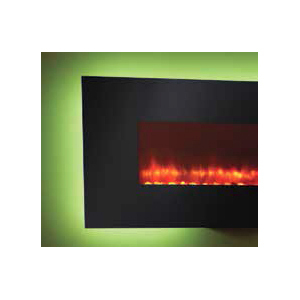 Customize every fireside experience, with heat and flame intensity adjustments. Colored LED backlighting surrounds each model. Colors can rotate or remain constant-you control the style and enhance the ambiance. Quickly and easily set the mood. Intuitive multi-function remote controls come standard. The 38-inch model comes with a stand. Mount it on the wall, or just set it down and plug it in.